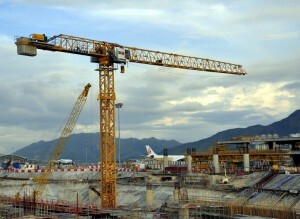 Gammon Construction has purchased two Liebherr 380 EC-B 16 Litronic flat-top cranes to assist construction of the Midfield Concourse project at Hong Kong International Airport. The 16t cranes are being used as part of the HKD6.2bn ($800m) contract awarded to Gammon by Airport Authority Hong Kong, and were delivered to Gammon by Liebherr’s Hong Kong distributor Shriro Machinery Co. The project involves the construction of a new passenger concourse, to increase the number of passenger aircraft stands and meet future demand at the airport. The cranes are based on the 355/380 IC tower system, suited for very narrow sites and for floor-climbing, says Liebherr. The building is due to be finished in September 2015 and will feature 19 aircraft stands, fixed link bridges and aircraft loading bridges, as well as an extension of the APM tunnel from Terminal 1 to the concourse, an extension of the South Runway Road, and a new taxiway.